The following remarks are intended only to help you, the customer, under the honing operation and procedures used to produce a quality product without flaws. It is not our intent to fully educate or confuse you, but try to give you a little insight of what to ask; how to answer; and where to get the best final results. If at anytime we can be of help please use the contact form or give us a call at our toll free number 1-800-515-8036. 1. What is the Inside (ID) Tolerance Needed? 0.750" ID thru 5.999" ID . . . .003" is standard. 6.000" ID thru 19.000" ID . . . .005" is standard. Closer tolerances can be held upon request. The mean diameter after honing will be within the finish ID tolerance. What is the micro required? The lower the number the smoother the surface. 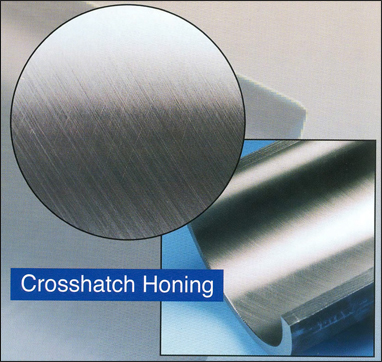 Circumferential vs. Crosshatch honing pattern or is either acceptable as long as the micro requested is achieved? 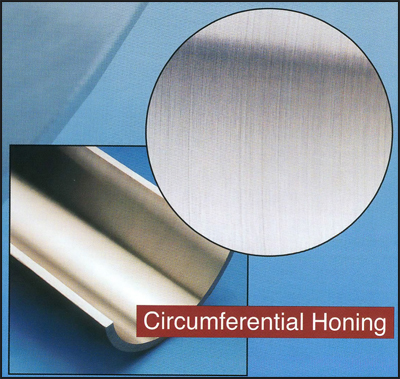 Circumferential honing pattern is circular (going around the bore of the tube); where crosshatch is two or more intersecting series of parallel lines. Question That COULD Be Asked When Having Tubing Honed . . .
How Do You Check ID Tolerance After Hone? By using dial bore gauges with extensions of up to eight feet long. Sometimes the dial bore gauge will leave a minute black line in the finish honed bore, which is cosmetic only, and has nothing to do with the potential of cylinder failure. If a customer so requests at the time of purchase order, ID readings can be obtained for up to five (5) places after the decimal. Please give us a call to discuss this option or use the quick contact form on the right of this page. The mean diameter of the tube after hone will fall within the ID tolerance so given at time of purchase order. Tubing that falls under 4% OD to wall ratio could have one dimension under low limit, but the 90 degree dimension over high limit, thus achieving the mean diameter win thin tolerance. Most generally, tubing with this amount of excessive ovality will round up during the assembly of cylinder. At times, an excessive ovality could result in given area, say the end of the tube, irregardless of wall, due to manufacturing process. Air exists above a surface; material exists below it. The surface is the transition between air and material. How do you measure ID surface finish after hone? 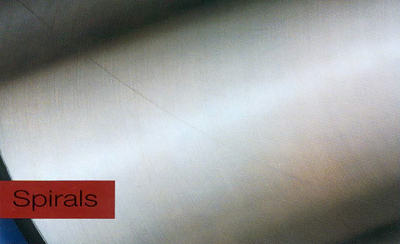 There are a Multitude of different methods of measuring surface textures, but the stylus method is the most widely used. 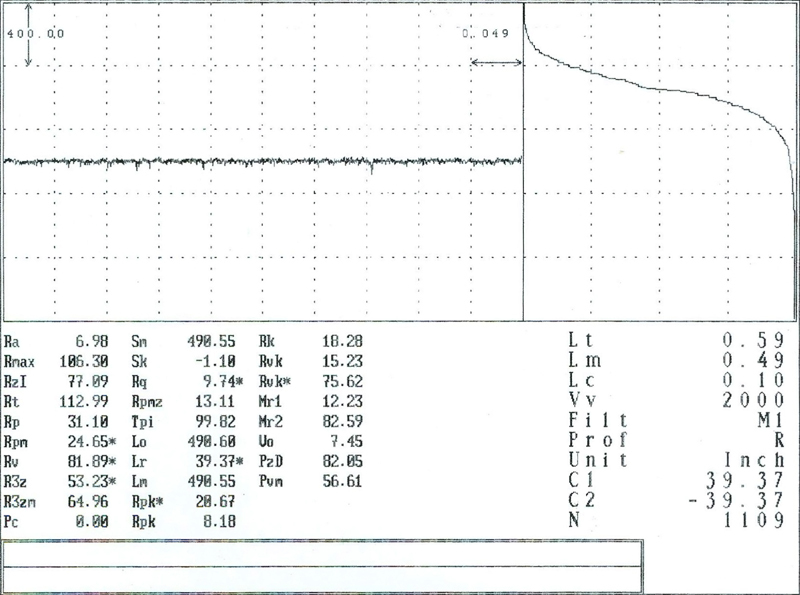 This instrument is called a Profilometer; root word is profile. A diamond stylus is traversed across the work-piece surface. The vertical displacement of the stylus is converted into an electrical signal. 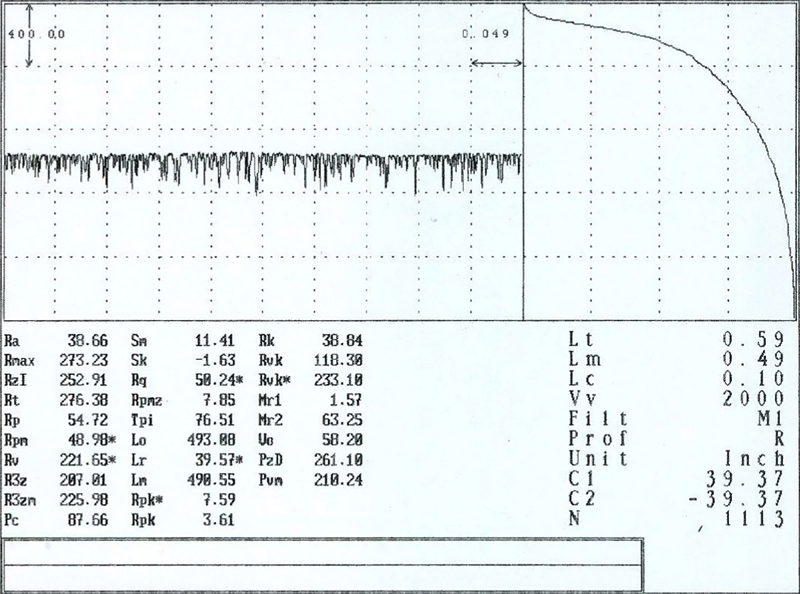 The signal is amplified before being converted into digital information. The digital information is then fed into a computer where different forms of numerical analysis take place. There are many different surface parameters available today, but we have in house capability of twenty-six (26). See samples below. 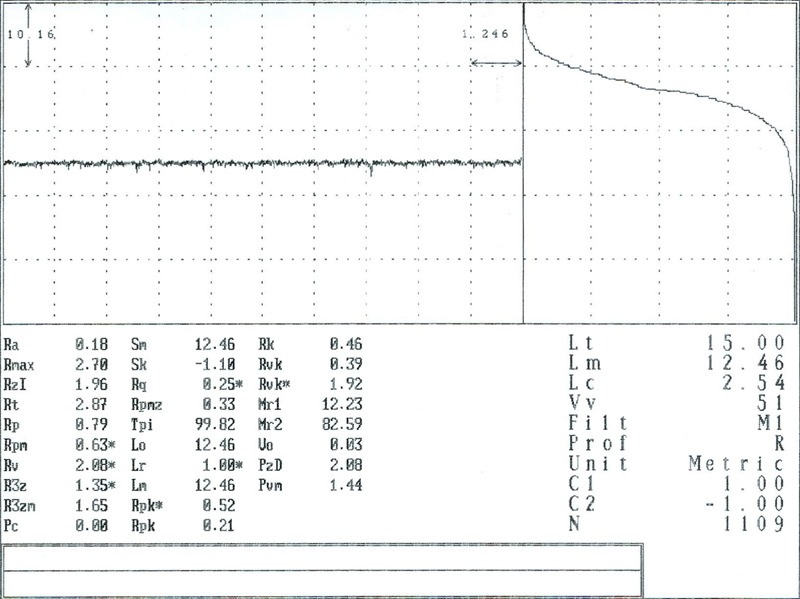 In 1964 RMS was replaced by Rq or Micro Finish when requesting a certain finish. Rq is the closest symbol to use when requesting a surface finish. Engineering Specifications will determine the final micro required. This chart is the same honed surface as above, but in Metric. Swipe honing essentially took the place of the SSID of former years, and is available in the smaller ID range. This chart shows the profile of a rough honed surface. Rough honing is just that; Holding an ID size but with a surface finish of 100 max micro. Generally, this is requested when welding is required prior to the finish hone operation. 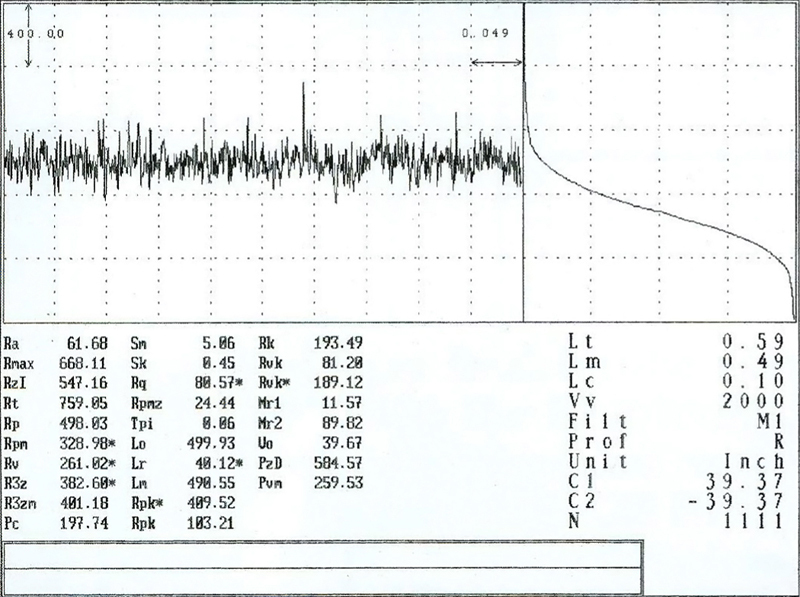 This chart shows the profile of a plateau honed surface. 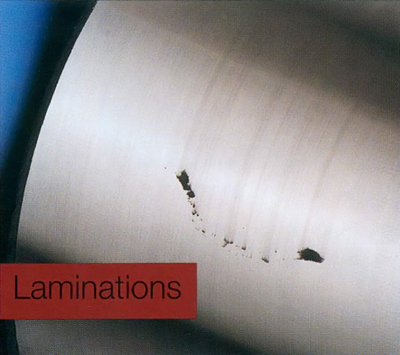 Plateau honing is the process of removing the peaks on a honed surface, but retaining the valleys. By removing the peaks prior to usage, the break-in time element is eliminated in the cylinder, less wear factor and no loss of break-in oil, greatly reduces the overall cost factor. Maintaining the valleys of the profile enhances the oil retention of cylinder, thus increasing the life of the cylinder. When ordering tubing to be honed, never violate the guidelines set forth by the producing mills, as to stock removal required to achieve a clean up of the bore. Anything else may nullify a claim. If straightness of the tube is of concern, always stay within the guidelines of producing mills, i.e., .010" per foot unless one-half the tolerance is needed, and can be purchased at a cost. If CDS or HFS is furnished, then an extra boring operation should be included. To get rid of the spiraling eccentricity of a seamless tube, one can go to what is called Class 3 honing. In this case 24" long honing stones will be used. 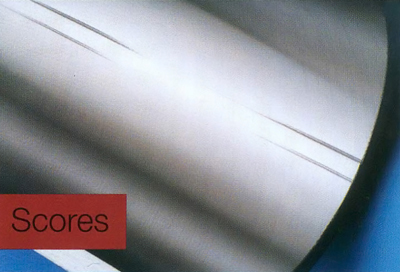 This type of honing is NOT required with WDOM tubing, due to the manufacturing process of the tube. After all tubing/pieces pass inspection, a rust inhibitor is applied to the bore and the ends plugged, wrapped or both, per customer specs. The average shelf life of the inhibitor is two months, but special grades are good for up to two years, at an additional cost. 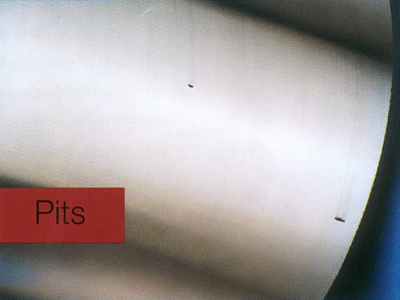 Mill claims for rejected honed tubing would be due to pits and scores (except for the allowable for swipe hone); laminations and dents. Longitudinal lines put in after hone (these generally can be rehoned to salvage). Undersize bore (can be rehoned to salvage). The micro is over the spec requested (these can be rehoned to salvage). Oversize bore (can only be salvaged by plating).